Fall is here. Do you have a Shetland Triangle? I can’t think of a more perfect time of year to have finished the Shetland Triangle. Gloves, scarves and hats will emerge from their summer slumber any day now. Why, this morning, for the first time this year, I searched my jacket pockets for gloves (none were to be found, of course… brrrr!). Fall is one of my favorite seasons for many reasons, not the least of which is the fall wardrobe – blazers and scarves and boots and general stylishness galore ;). The Shetland Triangle fits right in. Pattern: Shetland Triangle from Wrap Style, by Evelyn A. Clark. Worked as written, except I knit 13 repeats of the Body chart instead of 10. Yarn: Honfleur by Puppy, 50% extrafine merino, 30% silk, and 20% cashmere; 6 skeins (about 500 yards). The weight of this yarn is very similar to Debbie Bliss Baby Cashmerino, though it’s plied in a different way, and has a different texture (DB BC is more springy and lofty). Needles: INOX Express, US 4 circs (my circular needle of choice for most projects). Seems like “the right size”, no? In fact, I felt that everything about this project came together to make the right shawl for me. The yarn is soft, not at all scratchy, and blocked to be one of the drapiest fabrics I’ve ever made. The color is my favorite! The pattern was easy to follow, easy to memorize, and mistake-free. The stitch pattern is pretty, but not so fancy that it promotes the shawl to “special occasion only” status. The needles… INOX Express is always a good choice, and the size worked well with this sportweight yarn. Last, but certainly not least, I’ll always remember that the yarn for this shawl came from Siow Chin. Siow Chin, it was perfect, and the perfect amount! I have about half of one ball remaining. Thank you! this is such a pretty shawl!!! and just in time too! it’s probably going to rain over here in CA later this week–bleck! i just love this pattern–i think i’m going to give it a try as my 2nd lace project. my first will probably be a Yarn Harlot recommended beginner’s project…but before all of this, the log cabin blanket must get started! Really beautiful. The color looks great on you, too! It’s really gorgeous. I love that red. so lovely. 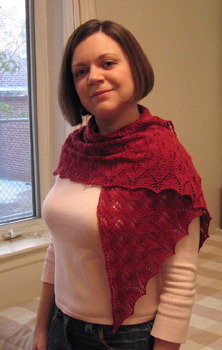 red seems to be a popular color for shawls. you’re keeping the shawl for yourself, right?! Jacket?! You wore a jacket this morning?? Wow, I’m so envious . . . it was 76 degrees (F) when I left my house this morning . . . oh, how I wish Fall would get to Texas! Nice job! I like that shade of red, very autumn-y. simply gorgeous, love the colour! Wow, that really turned out lovely! Perfect, perfect for fall in Boston! Lovely scarf–and it looks lovely on you. That is just gorgeous. I’m going to have to add that pattern to my list. Absolutely gorgeous. I LOVE that colour…it looks great on you. I am so happy to see that you knit a shawl for yourself. Could this be a new wardrobe item for you? I think shawls are stunning when worn as a scarf…I must make myself another one! looks wonderful, and the size is great! why would you want it smaller? it’s beautiful! that color is so rich and perfect. very flattering! Beautiful! You did a great job and it looks gorgeous on you. Love, love, love the color. It looks wonderful, and must be nice and soft, too. Love the color. That is very pretty. I wish I could get up my nerve to try something like that. Beautiful! I’m making one for my mom for Christmas. Oh — and thanks for the ‘review’ of the Knitpicks blocking wires. It came about 2 hours before I was going to use mine (also brand new), so I made sure to wipe them off before I used them! Why yes, I do have a Shetland Triangle. 😉 Yours is lovely. Happy Socktoberfest, by the way. I’m making some Jaywalkers; they’re so much fun. Nicely done! What a beautiful shawl! No, I don’t have one, but I love yours. Just beautiful. So the yarn you used was sportweight? I like the size of yours. I was planning to make one, but I may it larger too. Gorgeous! All your choices were perfect, from yarn and pattern to sizing and color! I feel like I could reach out and touch it! I can imagine exactly how it feels. Beautiful! I love that color! Darn it, now I’m itching to knit a shawl. It’s just beautiful! 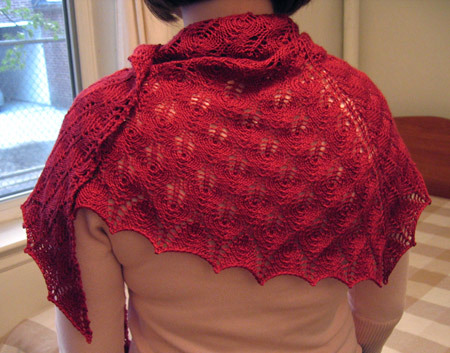 I had two myself – and I gave them both away *sob* Now I have no choice but to make another…..
Lovely shawl. I like the size you chose to make it, too. Wonderful knit! It looks great on you! The shawl is beautiful! The earlier pictures prompted me to go look at the pattern and also the other easy shawls you’d mentioned. Unfortunately, in the process, I learned that the very cool handspun laceweight yarn I brought back from Sweden with me last spring is not enough for a shawl; I guess a scarf will be in order instead. All of your projects are inspiring! That’s really lovely. I was inspired to finally go get a public library card and borrow this book today just so I can work this pattern. I’m excited to see that it’s bigger than the one in the book, but didn’t use tooooo much more yarn. Just what I’m looking for, I think. I’m so happy to see the little donuts of red yarn becoming such a beautiful shawl! And you knit it and wear it so well! It’s time I think of my own Shetland Triangle. That is a really great color, love it. The shawl is gorgeous. You did a beautiful job on it. Very very nice. Love the colour. Okay that tips it – I’ve ordered yarn for one. I have Jaywalkers OTN as well…hmmmm. It really does look great and very wearable – your hair looks great too! Gorgeous! You will look very chic this fall. Lovely! I’m looking for you wearing this on campus. I’ve been itching to try my hand at lace, but haven’t found the right thing for me. 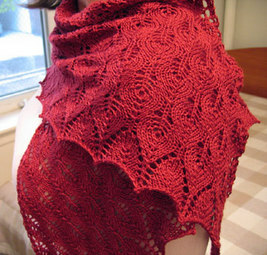 This shawl is inspiring! I already own the book, but didn’t love it based on the pictures in it. However, seeing it in my absolutely favorite color helps a lot! Congrats! It’s beautiful! Beautiful knitting and it looks lovely on you! Lovely pattern, gorgeous color. 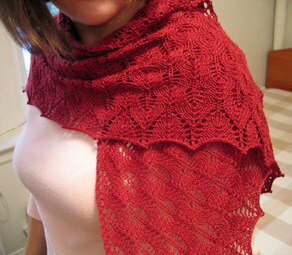 I’m inspired now to make this my first lace shawl project. But only after I finish at least 2 of the 6 WIPs. It really is the perfect size! Gorgeous. And it’s perfect for you. Amazing. The red even makes it a little racy, no? Gorgeous! It looks so lovely on you too, the color is great. I really ought to try knitting a shawl one of these days, I keep falling in love with other people’s. Beautiful work, that one actually looks like a shawl I would love to make ! Thank you for the beautiful pictures of the progress and finish ! Wear it and stay warm ! Absolutely gorgeous! Very fetching color! Pretty. Love the colour on you. wowsa! your shawl is exceptional!! love the color, love the pattern and you did such a marvelous job with it. i am so jealous and it makes me want to knit one myself. thanks for sharing, it inspires me. AB-solutely Gorgeous! I’m envious! Maybe I’ll grow half a nut and try some lace. Grumperina, so lurvly! Off to track down some blocking wires . . .
Fall dressing is the most fun. This needs some opera-length gloves, stat. I’ve been wearing my green Shetland Triangle pretty much every day this week. I made mine in RYC Cashsoft 4 ply in Fennel, a nice mellow green. Perfect size and such a lovely pattern. I would show you a photo but I don’t have one! I had missed this post. After seeing this I may have to make another in a bit heavier yarn. It is beautiful. Perfect addition to spice up this dreary season. I don’t have a finished Shetland triangle, yet, although I am working on one. I hope mine ends up looking as nice as yours does!